August Bank Holiday weekend is the last chance this summer to enjoy a PGL Family Adventure, with final reductions saving up to £400 for a family of two adults and two children aged five to 18 years! Two-night multi-activity breaks starting Saturday 25 August are offered at seven PGL centres across the UK. Prices now start at just £89 per person for a weekend that runs from Saturday afternoon to Monday afternoon. For example, at Bawdsey Manor on the Suffolk Heritage Coast, everyone now pays just £89 each, whether adult or child and regardless of room type. Brochure prices for families booking a separate room for the parents, with children in an adjacent room were £199 per adult and £179 per child, which means a family of four now saves a total of £400! The weekend includes all meals from Saturday dinner to Monday lunch, family-friendly evening entertainment and six activity sessions to enjoy (Sunday all day, and Monday morning). Activities vary from centre to centre but may include archery, aeroball, ropes course challenges, climbing and fencing. All equipment and instruction is included, with children as young as five being able to participate. £89 is the new price for Bank Holiday weekends at Bawdsey Manor, at Barton Hall in Devon, Liddington in Wiltshire, Osmington Bay in Dorset, Little Canada on the Isle of Wight and Barton Hall in Devon. Prices at Caythorpe Court in Lincolnshire and Boreatton Park in Shropshire start at £109 per person. Families needing to secure next summer’s holiday now have first choice of dates and accommodation on PGL Family Adventures, with prices frozen at 2015 levels AND a free child place – but only if booked by 18 December 2015. Classic Ardèche Experience – a week at PGL’s own Lou Valagran activity centre on the River Cèze, with a two-day descent of the magnificent Ardèche Gorge in Canadian Canoes, with the night in-between spent under the stars! Other activities include raft building, mountain biking and a zip wire. 2015 prices for the Classic Ardèche Experience started at (and remain until 18 December) £435 per adult, from £369 per child aged seven to 18 years, with the first child FREE. Advertised dates are 8, 14 and 21 August 2016. Fantastic French Adventure – a week in Normandy at PGL’s own 19th century Château du Tertre, set in 36 acres of wooded grounds beside the River Varenne. Abseiling, archery, canoeing, climbing, fencing, ropes course, rifle shooting and a trapeze are among the activities on offer. 2015 prices for the Fantastic French Adventure started at (and remain until 18 December) £449 per adult and £389 per child aged five to 18 years, with the first child FREE. Advertised dates are 14 and 21 August 2016. Paris & Disneyland Paris – a week at Château de Grande Romaine 20 miles outside Paris, and only half an hour’s drive from the popular theme park. As well as a day at the park and a day’s sightseeing in Paris, the 70 acres around this hotel-standard adventure centre provide opportunities for family ball sports, orienteering, swimming, zip wire fun, archery and boules. 2015 prices for Paris & Disneyland Paris holidays started at (and remain until 18 December) £509 per adult and £469 per child aged five to 18 years, with the first child FREE. Advertised dates are 24 and 31 July, 7, 14, 21 and 28 August 2016. To secure any of these holidays, book on 0333 321 2114 quoting LAUNCHX. The holidays/prices are based on own travel to France, on sharing en-suite family accommodation, and with all meals, activities and evening entertainment included. With its own dry ski slope and outdoor heated pool set in 46 acres above Torbay, PGL’s Barton Hall adventure centre is perfect for active family breaks, which are now reduced by 50 per cent at half term. A family of four can enjoy a three-night break from as little as £356 inclusive, in total! Choose three nights starting on the evening of Friday 1 June or four nights arriving Monday 4 June at this impressive country house above Torquay, in the heart of the English Riviera. The centre’s long list of activities includes a shoreline safari, archery, fencing and mountain biking as well as heart-pumping fun such as a giant swing, zip wire and trapeze. There’s also a lounge for relaxing in the evening, family bar and games room. The no-frills accommodation offers family rooms for up to six, or twin rooms for adults with kids in an adjacent room. Whether sleeping in the Victorian main house or purpose-built chalets in the grounds, every room has its own bathroom. Aimed at families with children from six years and upwards – PGL’s generous definition of a child includes 18 year olds on family holidays – the breaks include all meals as well as accommodation, activities, instruction and use of equipment. For SINGLES keen to take advantage of the two-day Queen’s Diamond Jubilee double bank holiday bonus, specialist operator, Friendship Travel, is featuring short break packages– which include a Jubilee-themed barbeque lunch and Black Tie Ball – in the market town of Harpenden. Starting on 2 June, these two-night fun breaks take place at the four-star Harpenden House Hotel, an elegant Grade 11 listed Georgian townhouse which retains many original period features including a magnificent 18th century fireplace in the sitting room. FAMILIES looking for something different over Jubilee half term will find it in Devon on a Family Active break with PGL. Barton Hall is just outside Torquay with sweeping views across Torbay. The centre has a great range of facilities for families, including its own dry ski slope! 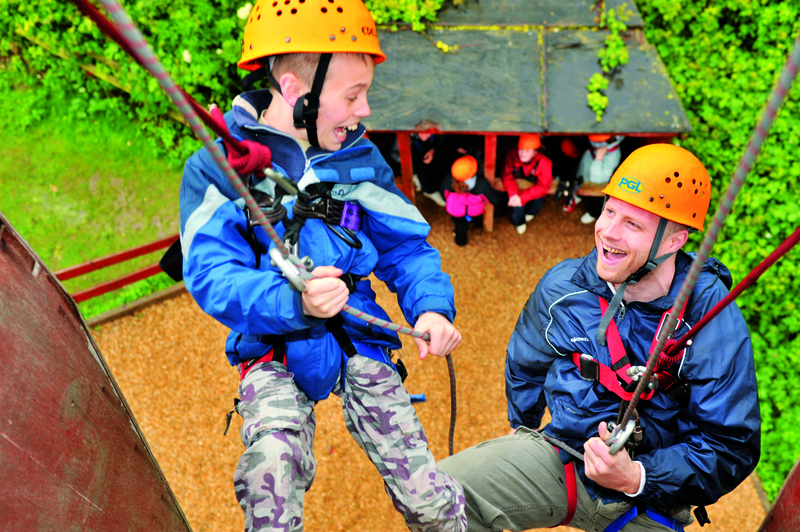 Activities on offer range from Abseiling and Aeroballing, to swinging on a Trapeze and screaming down a Zip Wire – all with expert instruction from PGL staff and all equipment.